I missed this place last time I was in the area so I made it a point to go there this time. Once we entered we were met with a medieval that was a bit strange but was not over done and provided for some interesting scenery once we got used to it. There is a decent sized area of tables on the left with the bar wrapped around the right. As usual we sat at the bar where the waitress was quick to bring us complementary pretzels and take our beer orders. The staff was also friendly and we chatted with them most of the time. They had a huge selection of beers for a brewpub at around 30 and they said it was a bit low and is usually 40+. Definitely a selection that even the pickiest of drinkers could find something to drink. The styles varied greatly as well wish Wee Heavies, an Imperial Stout, Irish Stout, IPAs both American and British, A trippel and so on. I had the Under the Kilt Wee Heavy on cask which was excellent. All others I tried were great as well the Earl Spit Stout, Imperial Stout, Crown Jewel IPA and 2 others I am forgetting. This was a great stop with the only disappointment being no bottles were available which was no problem since they directed us to a beer store close by that had them. A must stop if you are in the area in my opinion. 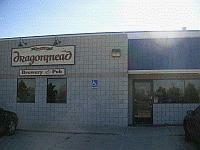 Finally made it to Dragonmead after wanting to come here for years. Huge beer selection, as well as house made mead and wines. I tried the Crown Jewel IPA, and another one whos name escapes me. Both were good, not great. They had a few meads on, my wife enjoyed them. Service was so-so, but we had a nice talk with one of the bottlers. Didn't try the food. A slight disappointment, but glad I finally got to give the place a try. Been going to this place for a long time. Owners are great, staff on the other hand is okay. I've witnessed a few flips in staff, some for good others for bad. On the upside, beer at this place is great! They do run out of a lot of the favorites and Fridays are nuts to butts. Atmosphere is cool and laid back, on a weeknight when servers are free they're very willing to assist in helping Budweiser drinkers find the correct beer. Food is bar junk, used to allow outside food in. Now its greasy sausages, waffle fries and cheese plates. Located right off a main freeway makes it an easy destination north of Detroit. They usually have about 45 beers on draft. Solid representations of styles. Crown Jewels is a great British IPA, Final Absolution Trippel is a must-have. Every time I've been the service is fast and friendly, the décor is awesome (except for the exterior, it's very easy to miss Dragonmead if you're not familiar with it. It blends into the offices/warehouses that surround it). Menu is meat, meat, and fries right up my alley. Beer, wine and mead selection is world class.